Twisha started playing the Piano at the age of eight. She has been under the tutelage of Dr. Juliana Yap from Morgantown WV since 2013. 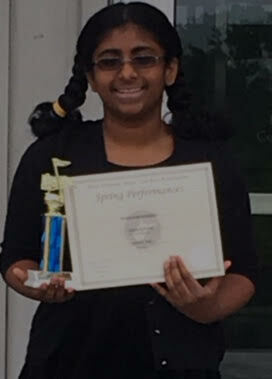 Twisha had participated in two technique tests, two adjudications and two recitals / performances in the West Virginia Music Teachers Association (WVMTNA) in 2016 and 2017 and won trophies. She also recently participated in adjudication competition conducted by WVMTNA. Twisha is very interested in both Western as well as Indian Classical music. Twisha is a 7th grader in middle school and enjoys Math and Science subjects.